For Fin, it's just like any other day, racing for the school bus, bluffing his way through class, and trying to remain cool in front of the most sophisticated girl in his universe, Lucy. Only it's not like any other day because, on the other side of the world, nuclear missiles are being detonated. From an exciting new voice in Australian YA literature, Claire Zorn, comes a haunting novel, The Sky So Heavy, a mesmerising story inspired by the continued debate over Australia's treatment of asylum seekers and how a line through a map can determine your fate. The day started as any other for seventeen year old Findlay Heath, he ran late for school, tentatively flirted with Lucy at the bus stop and lightly joked about the dilemma of completing their homework while the news reports incidents of nuclear testing. As usual, no one on the bus sat next to Arnold Wong, n one ever does. He's the kid that no one wants to be seen talking to, never mind sitting next to. Lucy and Fin continued to banter the prospect of nuclear testing, debating whether or not to attend the protest march organised to oppose the tests. As usual, Fin listed to Mister Effrez encourage them to join the protest, praising the work of activists that are building a self sustaining settlement and the impact of global warming to our humble planet. Fin's mother works for the government in disaster management, so when she calls Fin in a panic, Fin realises that something is very, very wrong, even before the wail of the evacuation sirens. On his mother's instruction, Fin and Lucy start stockpiling canned goods and non perishable items from the local supermarket, taking as much as they could possibly carry. The first signs of destruction starting to seep into the small Blue Mountains town, the sky glowing, choked with a dense orange dust. On what could possibly be the last news broadcast that Fin and little brother Max may see, the nuclear missiles that launched has gone awry, decimating cities and bushland. Within days, the dust will choke the atmosphere and prepare for the temperature to drop significantly. But within hours, the nuclear winter sets in, their father and step mother haven't made it home before the road closures and the boys are left to fend for themselves. With no power and no news, the township are relying on the authorities and army to bring in supplies, but as the food shortage starts to stir people into looting, it's clear that the streets aren't safe for two unaccompanied boys. The world has gone into hibernation, and the boys haven't any supplies left. The army haven't been back since the initial rations given to each house and even those in power are now taking advantage, barging into homes and demanding what little edibles that citizens have left. But when Fin runs into Arnold Wong, that the boy who was teased, tormented and traumatised, he finally finds an ally. Arnold still finds the kindness others lack, to help provide for Fin and Max, and the neighbour's little girl who they've taken into their home. Arnold is all alone, his parents were overseas working for the church when the missiles struck. No matter how many times Arnold has been knocked down, he still expects Fin to return when they've run out of food again. But it's clear they can't stay where they are, the police are using standover tactics and stealing, the army and emergency services have abandoned them, so the boys have no option than to find their way into the city to find their mother. Along with Lucy, Fin, Max and Arnold, who is affectionately known as Noll now, all decide to to pack up whatever they can use to survive and leave town. Lucy is leaving behind her family, who understand that her best chance of survival is to go, anyone left behind is sure to die during the freezing temperatures without power and sustenance. With the use of a neighbours car, the group reach the outskirts of Sydney but it seems that as the car is attacked by a brick wielding looter, that these people aren't any better off than the Blue Mountains town. It isn't until they see the line of parked cars with the glint of taillights within the soot, beyond the cars is an unscalable fence, barricades with road closure signs, they see that the cars aren't moving, riddled with bulletholes and blood splashes. They aren't allowing non residents into the city, and it's clear that the deceased lying in their cars had tried to unlawfully enter. The army are patrolling the city border, and the four teens are told to leave. Anyone on the outer is left to die, with the city containing and controlling what limited resources they have and giving them to those that are of importance. As desperate as they are, the only way to survive is to make it inside the city walls to seek refuge, but is it worth risking your life for? When your options are to die on the outer slowly or be shot breaking through, which would you choose? The Sky So Heavy was absolutely brilliant, I simply couldn't put it down and read it in it's entirety in one sitting. 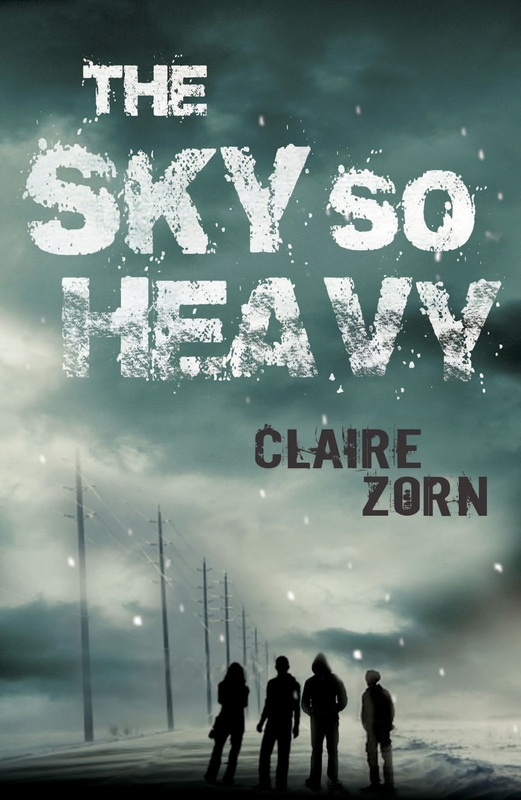 There is something so effortless with Claire Zorn's style of writing, it's realistic and gritty and that's a rarity in young adult today. This isn't your average apocalyptic, disaster dystopian, Claire has woven an story that brings the treatment of Australia's asylum seekers to light. I don't consider myself political whatsoever, and really didn't have an opinion either way, but the treatment of the group of teens trying to escape and access the city to survive wasn't too far removed from what happens on our shores each day, and it wasn't until I discovered The Sky So Heavy that it's the first time I've thought about how quick we are to exclude others, believing it's in our best interests to survive. I loved twelve year old Max, he's sassy and smart mouthed and clearly has the personality and quick wit that bypassed Fin. My only complaint is that I need more, I want to know more about the self sufficient community, the environmental changes and just how the world, and Australia in particular will survive. I'm keeping my fingers crossed for not only a follow up, but the potential for a trilogy even. I have to know what happens and Ms Zorn has left me in suspense. I shall stalk her now until she gives in. Great review Kelly, I saw this book at the bookstore and wondered about it, but haven't heard much about it. Your review makes me all the more curious, it sounds like a good survival story. Ohh Jeann, you'll have to pick it up, it was brilliant. I don't know this author. THANKS for sharing.